China launched its “go global” strategy over a decade ago, and has funneled upwards of US$ 120 billion into Latin America, more than any other country. Bu this comes to an environmental price. Español. Português. China’s increased trade and investment in Latin America over the past decade has resulted in powerful social and environmental impacts such as job losses and pollution, although the growing relationship has also brought some benefits, says new research published today. The high concentration of Chinese activity in Latin America’s agriculture and extractive sectors has placed a heavy strain on water supplies, increased deforestation and greenhouse gas emissions (GHGs) and is aggravating local concerns about resource use and job creation, the study coordinated by Boston University’s Global Economic Governance Initiative (GEGI) concludes. But the paper, entitled China in Latin America: Lessons for South-South Cooperation and Sustainable Development also highlights the potential for cooperation on renewable energy projects. And while China’s mining, hydropower and railway companies are stamping an indelible footprint on Latin American landscapes, the paper notes that Chinese companies do not necessarily perform any worse than other international firms operating in the region, despite their relative inexperience andlower levels of regulation at home. Since China launched its “go global” strategy just over a decade ago, Chinese investors have funnelled upwards of US$ 120 billion into Latin America, more than any other country or international lending institution. Loans to Latin America have increased more than 20% year on year since 2005. 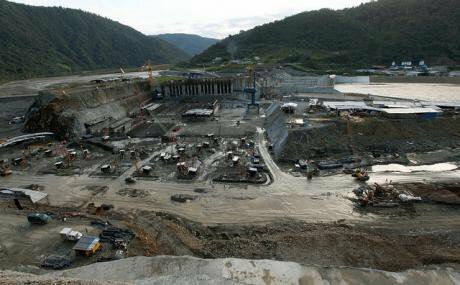 These investments, mostly by China’s state-led policy banks, enable the construction of dams, roads, ports and mines that act as a “major driver” of the degradation of sensitive Latin American environments, the paper says. Investments have stimulated the growth of a trade relationship that yields some of the most striking findings. Around 100 billion cubic metres of water, almost the same volume as Lake Nicaragua, the largest freshwater reserve in Central America, was embedded in Latin American exports to China in 2012 alone, the paper revealed. High commodity prices in the 2000s driven by China’s rapid growth led many Latin American governments to prioritise the export of primary products. Lucrative returns from exports like oil, gas, copper and soya alleviated balance of payments problems, and even allowed some countries to accrue surpluses. But at the same time this set the region on an environmentally hazardous course. Latin America has doubled its agricultural exports to China in the last decade. Food security is a top priority in China as it seeks to satisfy the alimentary needs of its increasingly carnivorous population and Brazilian and Argentine soya, crushed to make soymeal, are widely used sources of food forChinese livestock. Brazil, which has been plagued by drought in recent months, exports around 82% of its soybeans to China, some 32 million metric tons each year. But the cultivation of cash crops has put a strain on scarce water resources and farmers are using ever more intensive methods such as genetically modified (GM) crops and stronger chemical pesticides. Despite some public resistance, China lifted restrictions on GM food imports in 2013 and GM soya purchases from Brazil have increased as a result. Food safety regulations are slackening on the demand-side and the increasing share of GDP generated by Latin America’s agriculture and hydrocarbons sectors is further empowering its big businesses and ‘dirty’ ministries and encourages them to relax social and environmental protections in search of higher returns. Between 2009 and 2013, extractive industries accounted for 56% of all Latin American exports to China compared to just 25% between 1999 and 2003. As a whole, exports of minerals and metals from Latin America have increased from 22% to 33% over the respective periods, the research states. But while primary industries are highly carbon- and water-intensive, the amount of GHGs emitted by Latin America in getting products to the Chinese market only amounts to around half of the emissions that result in products that China sends to Latin America, the report finds. At the same time, importing Chinese manufactured products has had a detrimental impact on Latin American manufacturing. Not only has the share of higher value-added activities fallen over the last 10 years, the prospect of social conflicts has risen as new jobs created in resource-based industries have been far fewer than those lost in manufacturing. Employment opportunities are a major concern for Latin Americans worried that many of the new jobs created in key industries will be reserved for Chinese workers. In Ecuador, foreign companies are unable to employ foreign workers as long as local workers are available, But in Brazil, the country’s federal parliament recently tabled controversial labour reforms that would make it easier for companies operating in the country to subcontract or outsource to foreign workers. In Argentina, President Cristina Fernandez de Kirchner had to allay fears that the majority of jobs constructing two new nuclear power plants will not be through China National Nuclear Corporation (CNNC), the contractor supplying the reactors and other nuclear technology. However, not all social impacts have been negative. China’s Chinalco relocated an entire village of 5,000 inhabitants from the highland town of Morococha in Peru, which was suffering the consequences of poorly regulated copper mining. So as not to exacerbate toxic waste and pollution, Chinalco constructed a shiny new town with proper sanitation, a school and a hospital. The report points out that China, through its production of cheap photovoltaic solar panels, has contributed to an increased share of renewables in Chile’s energy mix. A Brazilian wind power operator could soon be owned by a Chinese counterpart, which could enable more low carbon capacity to be added to the country’s national grid at a time that hydroelectric output has been curtailed by droughts. The paper says that low-carbon partnerships can be also developed in other areas, such as creatingsustainable cities. Urban expansion accounts for a substantial proportion of Latin American countries’ GHG emissions, although China’s experience suggests that building-in low-carbon infrastructure is fraught with obstacles. Research on China and Latin America gives rise to some worrying statistics, and learning lessons will be crucial for the partnership to pursue a more sustainable development path.